The Long Branch neighborhood is located in Northern Virginia in Fairfax County, which has one of the highest household income levels in the United States. Our ZIP code is 22003 and we are often termed a "suburb of Washington D.C."
Google for “Windflower and King David Annandale Virginia” to find Long Branch. Our neighborhood is bordered by a stream named Long Branch on the North, Braddock Road on the South, Guinea Road on the West and roughly by Red Fox Drive on the East. By car, Long Branch is 2.3 miles from the Capital Beltway Braddock Road exit and entrance. Stops for buses to the Pentagon border Long Branch. The Pentagon is a major Metro connection. 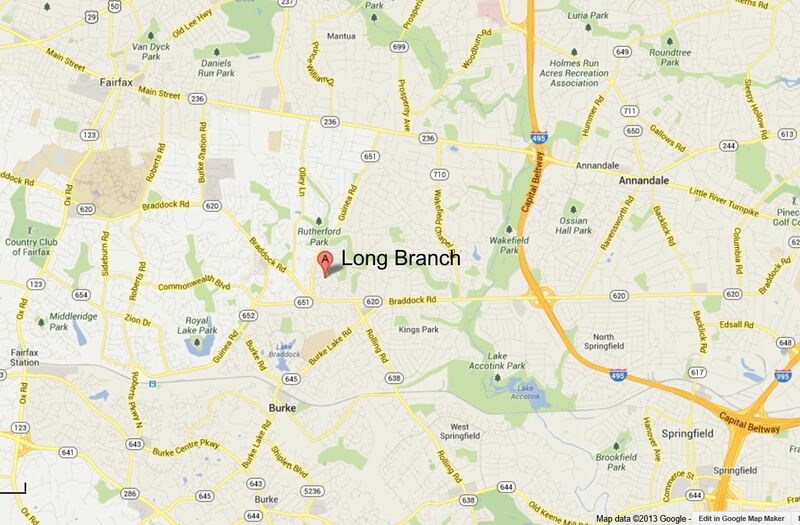 The Long Branch neighborhood is 5.8 miles from the Vienna Metro Station, 5.3 miles from the Dunn Loring Metro Station. It is 2.6 miles to a Virginia Railway Express Station which transits to Washington D.C.